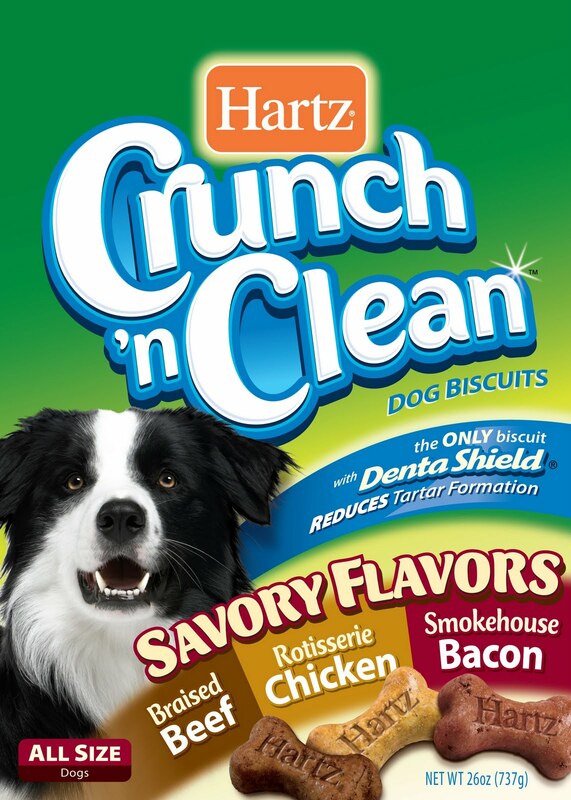 The new Hartz Crunch 'n Clean Savory Flavors Dog Biscuits are the latest addition to the company's popular Crunch 'n Clean line of biscuits. The box comes with three different flavors of biscuits dogs love - braised beef, rotisserie chicken, and smokehouse bacon. They're the only dog biscuit with DentaShield technology which is clinically proven to reduce tartar formation for cleaner teeth. On top of that, the biscuits also include breath-freshening crystals and important vitamins and minerals. My dog Dotty always has tartar buildup and everytime we go to the vet, that is the one thing they say to work on. 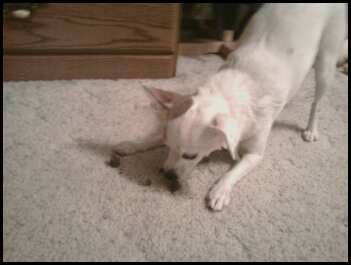 She doesn't like toothbrushes, so I use tooth cleaning wipes for dogs that have baking soda in them. But still, she has tartar buildup. I have bought her other dental treats before but she never cared for them much. One kind looked like tiny green rice cakes, and my dog didn't even think they were for her because she didn't think they could possibly be dog treats! They didn't look or smell very appetizing at all. 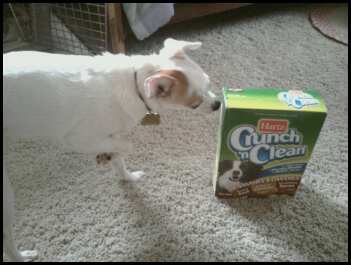 But with the Hartz Crunch 'n Clean Savory Flavors dog biscuits, I couldn't get the box open fast enough for Dotty, she could smell the great flavors right away! And ever since we got them, she will "sit pretty" (i.e. cross her front paws) in front of the treat cupboard just waiting for another Crunch 'n Clean biscuit! She has no idea they are good for her too! I inspected her teeth today after giving her the treats for several days, and the yellow plaque buildup has decreased a lot. I am very surprised and pleased! I think it also helps that she can't swallow these biscuits down in one gulp like she often tries to do - for a small dog, she sure can inhale food fast. But she has to take her time chewing these biscuits because of the extra crunchy texture, which in turn means longer crunching time for the mechanical removal of plaque that comes with chewing, gnawing and biting. Plus, she seems to be more satisfied since it takes her longer to eat. All in all, I am very impressed with Hartz Crunch 'n Clean Savory Flavors Dog Biscuits, and Dotty loves them! 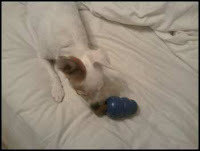 They fit perfectly in her Kong treat toy too. You can visit www.hartzcrunchnclean.com for more information and download a $1 coupon to buy your own box! Your dog will love them, I promise! Disclaimer: I was given Hartz Crunch 'n Clean dog biscuits free of charge for the purpose of this review. All opinions are my own experiences with the product. Individual results may vary. No other compensation was given. Found you over @ Making Friends Monday! I'm your new follower. Come visit and follow back! Following you :) Love your cute bloggy! !